Let me get this out of the way first–while co-blogger Nick continues to deliver the goods, you may have noticed that your humble webmaster (me) seems to have dropped off the face of the earth. This is because the contract gig I’ve been working is nearing its end, so it’s back to the great fun of seeking employment in a rancid economy. The leads have actually been pretty good this time out (I came thiiis close to landing a job last week), but until some order is restored to my life, posting will be light. So if anybody out there has a line on opportunities in Austin, by all means drop me a note. So that’s the bad news. The good news is that our friends at Blackbird Books, who brought us Westlake’s Elizabeth Taylor bio not long ago, are back with another DEW rarity. 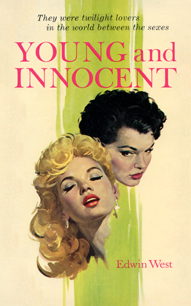 This time out, it’s his 1960 sleaze novel Young and Innocent, written as Edwin West. The world of New York publishing! Lesbians! Westlake! What more could you ask for? Once again, Blackbird delivers a top-notch product at a great price. The cover is beautiful, as you can see. Rather than the high-gloss finish of Elizabeth Taylor‘s cover, Young and Innocent has a subdued finish that gives it that old paperback feel. Another terrific reprint. Here’s hoping there are many more to come. Just got this one. Looks awesome! I can’t wait to read it.